The last week and a half have been busy around our house. 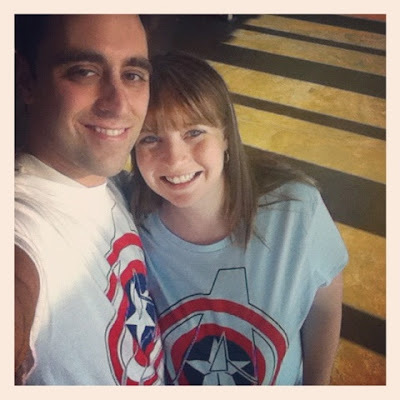 Jason and I went on a date last Friday and got to see the Avengers. It was awesome! Jason has been waiting for that movie to come out for months and has watched every trailer for it the day it comes out. We got matching shirts and went and saw it while Carly and Will watched Carson. We were not disappointed! 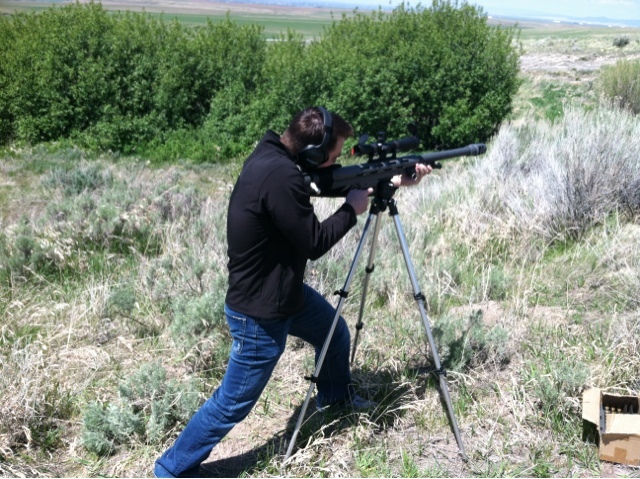 The next day we went shooting with Chris and Keira. Jason shot Chris' 50 caliber gun and was pretty excited about it. 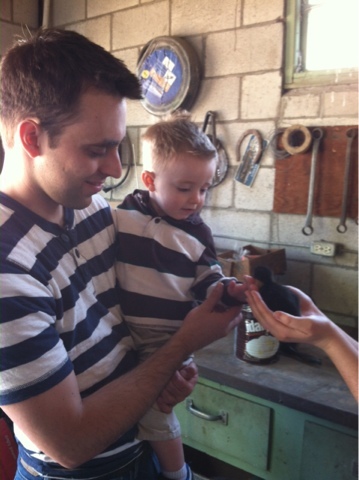 Keira's family has ducklings and Carson got to pet one! He loved it! It was really cute and he kept saying "quack quack". He is so good with his animal sounds! Jason shooting the "Big Gun"
Jason was supposed to be at convention this week but got to stay home and take care of some issues in the office. I was glad since I'm only 2 weeks away from my due date with the baby. He went into work early and stayed late everyday, but it was still really nice to know he was in town. Carson and I played outside a lot this week and spent time with friends. 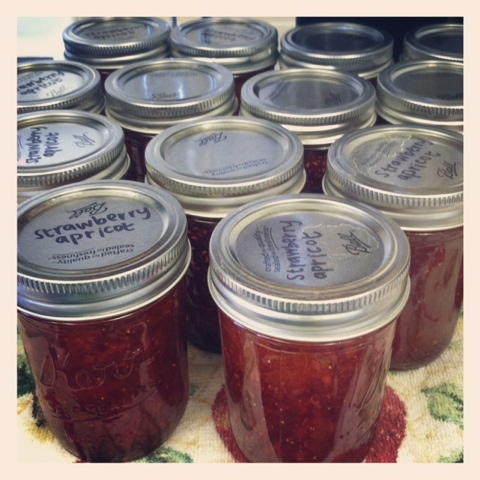 Ashley and I spent an entire day making jam. We made strawberry, strawberry peach, strawberry apricot, strawberry raspberry, and triple berry. It was a long day, but we got a lot of jam out of it. Jason and I worked in the yard all day yesterday and I really hoped it would send me into labor. I even mowed the entire back lawn....which did nothing but make me sore. I also canned salsa and made blackberry apricot jam this weekend, both of which turned out great! On Friday, Carson went #2 in the potty! We have had a potty sitting out for a while now and he will sit on it and pretend to go potty. He had just gotten out of the tub and I could see the face starting, so I told him to go sit on his potty. He did and he used it! Yay! Later on that morning, however, he decided to go #2 in his bedroom and then stepped in it and got it everywhere. A bottle of Sol-u-Mel and Sol-u-Guard later his room was finally livable again. Haha! Jason was called to be the ward Sunday School President and I was called to be the Young Women's Secretary. We are both really excited about our new callings! Other than that we are just trying to get things ready for the baby. I need to finish putting her room together and pack my hospital bag.... Hopefully she will give me just a few more days. is it weird that i like seeing your handwriting on the jam jars??? hahaha. i was like, oh there's natalie! haha. can't wait to see baby girl messano! 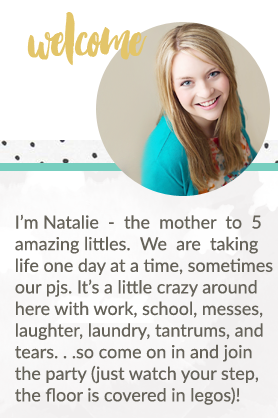 so glad you've been staying busy!